The Spartan apple is an apple cultivar in 1936. The Spartan is notable for being the first new breed of apple produced from a formal scientific breeding program.It was raised at the Canadian Apple Research Station in Summerland, British Columbia, in the 1920s, and the mother variety is McIntosh (of course). The apple was supposed to be a cross between two North American varieties, the McIntosh and the Newtown Pippin, but recently, it was discovered through genetic analysis that it didn’t have the Newtown Pippin as one of the parents and its identity remains a mystery. The Spartan apple is considered a good all-purpose apple. Medium in size and round in shape the skin of the Spartan apple varies from bright red to dark purple red and background patches of greens and yellows depending upon how long it is allowed to ripen on the tree. Its red color becomes purple / maroon when fully ripe. Its crisp white flesh is aromatic and exceptionally juicy with a balanced sweet tart apple flavor. An excellent keeper, the Spartan apple becomes slightly sweeter in cold storage. 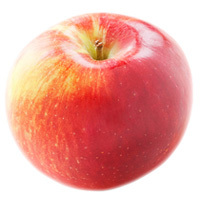 The Spartan apple is an excellent cooking and dessert apple. Its firm flesh will hold its shape and maintain its sweet flavor when baked into pies, crisps and turnovers.